My Mum had a thing about loo paper and making sure she didn’t run out. Mum was born during the Great Depression and for a lot of people in her generation, toilet paper like we know, and take for granted today, just didn’t exist. For her, if they had anything to use at all, it was newspaper. So you can understand why it was something special to her. So much so, that she would stock up when her favourite brand was on special. However, her attachment to loo paper became a bit of a family joke as there were always rolls and rolls and rolls and rolls…on one count, Mum had over 70 rolls of loo paper…and she lived alone. When I went down to Melbourne to spend her final weeks with her, I was amazed to find that I actually had to go and buy some as she was down to her last roll. Yes, there was a synergy of experience happening on more than one level. 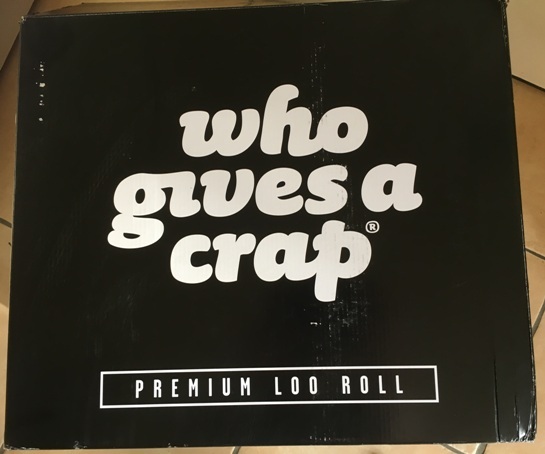 Last year, a friend gave me a couple of rolls of “Who Gives a Crap?” loo paper as a Christmas present. And before you say anything, I was actually thrilled as I had been wanting to try it for a while. I had heard the founder speak at a conference late last year and I was impressed by this company. They source their materials ethically (the premium loo paper is made from bamboo) and 50% of their profits are utilised to create toilets, hygiene and sanitation projects for those in need. So, enthusiastically we tried this new loo paper, curious as to whether it would be as soft as our normal brands. Well, not only was it softer, it also went the distance, literally. We typically get a couple of days out of a normal roll. These two rolls gave us almost 1 1/2 weeks!! Now, this loo paper is more expensive than the normal ones, but with having the triple win (softer, lasts longer, helping communities) we decided it was worth it to make the change. And here’s where it gets weird. To get the best value for our purchase, I had to buy in bulk through the Who Gives a Crap website (click here). Today, the delivery man rocked up with a big box – a big box that contained 48 rolls of loo paper!! That’s roughly 9 months’ supply of loo paper for us. And every time I have thought about, I absolutely reckon that on her side of the realm my Mum is having a serious chuckle at us & our bulk store of loo paper. So here’s to you Mum – Bottoms Up!! Do you have any weird things with your precious peeps who are no longer in our realm? Would love for you to share if you do.